Size of this preview: 737 × 599 pixels. Other resolutions: 295 × 240 pixels | 590 × 480 pixels | 738 × 600 pixels | 944 × 768 pixels | 1,259 × 1,024 pixels | 2,272 × 1,848 pixels. 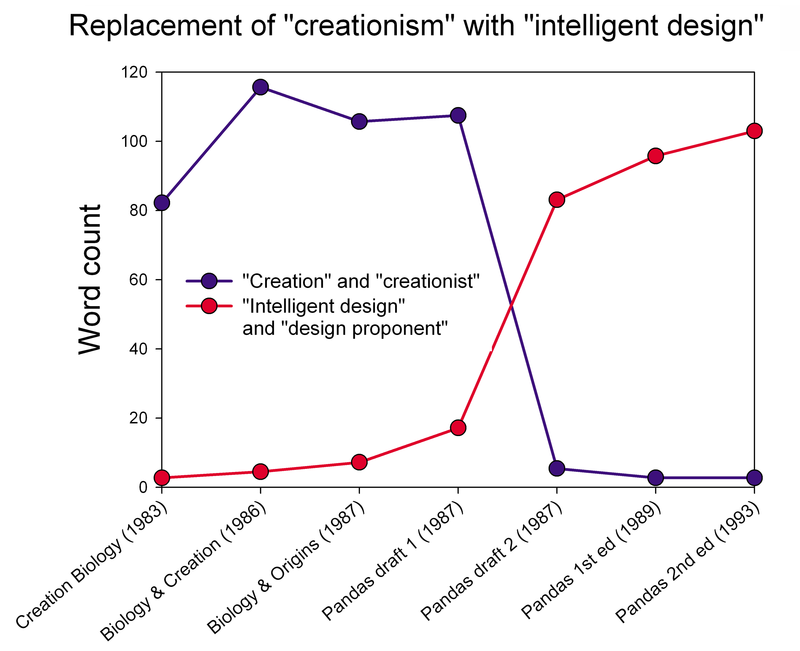 English: Textual analysis of the various drafts and precursors of the Intelligent Design book Of Pandas and People showing the frequencies of the terms "creation or "creationist" versus "intelligent design" and "design proponent". Based on data from the Barbara Forrest's testimony in the court case Kitzmiller v. Dover..
current 17:17, 27 September 2016 2,272 × 1,848 (246 KB) Cmdrjameson Compressed with pngout. Reduced by 88kB (26% decrease).